Founded on a remarkably rigid structure - especially for a convertible - this Silver Arrow's fully independent suspension precisely controls each wheel for a fluid ride and cornering excellence. Damper struts up front and Mercedes patented 5-arm multilink design in the rear employ separate coil springs and gas-pressurized shocks for highly consistent response. The amazing Electronic Stability Program (ESP) monitors your steering and braking inputs and detects the onset of plowing or fishtailing. The system then brakes individual wheels and/or reduces engine power to help restore your intended course. The Antilock Braking System is designed to help you maintain command over steering during heavy braking, pumping the brakes up to 30 times per second if it senses impending wheel lockup. And Brake Assist, a Mercedes-Benz innovation, detects emergency braking from how you hit the brake pedal. By applying all available braking boost to help overcome the natural human tendency not to brake hard enough, soon enough, it can potentially shorten a panic stop. And let you get back to the sheer joy of driving. leather-trimmed dash, doors and standard hardtop trim. The Bose sound system with 6-disc CD changer features voice control. NEW YORK - Mercedes-Benz USA announces the SL Silver Arrow Limited Collector's Editions for the spring of 2001, commemorating the long lineage of successful Mercedes-Benz sports car, sedan and Formula 1 racing cars. Available in both SL500 and SL600 models, each SL Silver Arrow Edition receives a host of special equipment. Both models receive Silver Arrow metallic paint; fully-lined black soft top; brushed aluminum instrument cluster with chrome bezels; aluminum trim on the wind deflector, shift gate, pedals, grille and trunk lid. In addition, unique mechanical componentry includes new multipiece, six-spoke 18-inch alloy wheels with 245/45ZR18 and 275/35ZR18-inch tires front and rear; factory-drilled brake rotors front and rear; Xenon high-intensity gas discharge headlights and a six-disc CD changer. Inside, Silver Arrow SL500s feature two-tone leather upholstery in silver and black for both seats and door panels and leather-trimmed steering wheel and shift knob. Silver Arrow SL600s receive black leather upholstery with silver perforations, a combination leather/black bird's eye maple steering wheel and shift knob, plus a Panorama hardtop and multicontour seats. 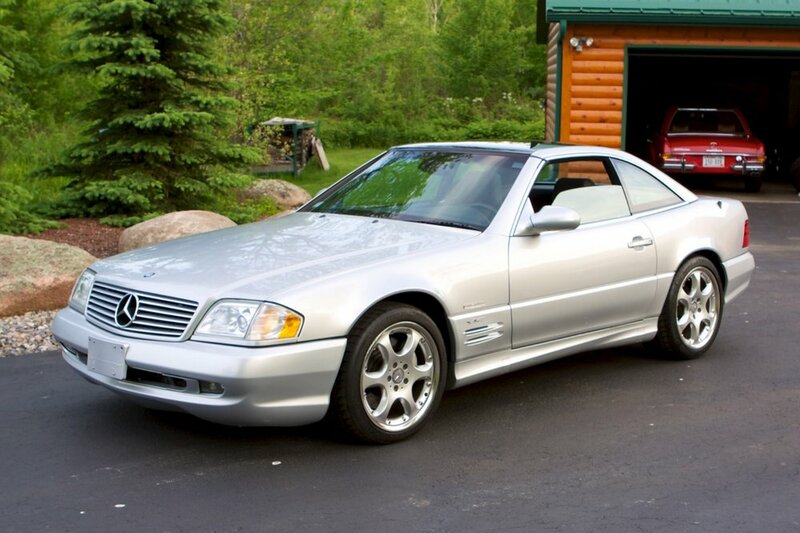 These model-year 2002 limited-production SL Silver Arrows will begin availability in April, 2001. This coupe/roadster series, which traces its own roots to the racing-derived 1954 300SL Gullwing, has quickly become a modern classic. Technical sophistication has always been a hallmark of the SL-Class and the 2002 models continue that tradition. An advanced, all-aluminum 5.0-liter V8 in the SL500 develops its high power output of 302 horsepower while operating at remarkably clean emissions levels. The SL500's engine uses a twin-spark/three-valve-per-cylinder arrangement that produces excellent power with very low emissions. Two intake valves are accompanied by one exhaust valve per cylinder, which makes room for two spark plugs per cylinder. Both spark plugs fire upon each stroke, but alternate sequence (depending on rpm, load and other parameters) to maximize combustion. Advanced engine management orchestrates those events. A dual-path intake manifold boosts torque at low engine speeds. The engine's torque peak of 339 lbs.-ft. is sustained from 2,700 to 4,250 rpm. The result is quicker response at all engine speeds and remarkable acceleration. Mated to a smart five-speed adaptive automatic transmission, the SL500 rushes from 0-60 mph in just 6.1 seconds, yet, even while offering this kind of high performance, qualifies under strict testing as a California Low Emissions Vehicle (LEV), and performs at Ultra Low Emissions Vehicle (ULEV) levels. The limited-production SL600 roadster is one of the world's few V12-powered automobiles. Its aluminum 6.0-liter, DOHC, 48-valve engine makes that rarity worthwhile. The SL600 produces 389 horsepower and 420 lbs.-ft. of torque. Unique intake manifolds for both cylinder banks also use large plenums that help boost torque, and lead to individual runners that feed each cylinder. Along with all the luxury the SL600 provides, it can sprint from 0-60 mph in a mere 5.9 seconds in unbelievable comfort, thanks to the unique natural balance of its V12 engine. Mercedes' acclaimed electronic five-speed automatic transmission in both the SL500 and SL600 not only adapts to changes in road grade (delaying upshifts on ascents for climbing power and hastening downshifts on descents for engine braking), but also meshes with an individual's driving style in fully automatic mode. The computer adjusts shifting logic during leisurely driving with smooth upshifts for the best fuel efficiency. A driver who requires frequent highway merging, on the other hand, will find the transmission holds each gear longer for quicker acceleration. In addition, the Mercedes "Winter" switch engages second gear from a standstill and instructs the transmission to upshift at lower engine speeds, enhancing traction in slick conditions. Mercedes-Benz continues to lead the industry in safety technology, having pioneered such features as the safety cell body structure, supplemental restraint systems (SRS), anti-lock brakes and traction control. All Mercedes-Benz models have ABS anti-lock brakes, dual front airbags and door-mounted side airbags. The 2002 SL-Class models benefit from what is arguably the largest array of safety technology in the segment. Since an open car can leave its occupants vulnerable in a rollover, Mercedes-Benz met the challenge with the world's first automatic roll bar. Normally part of the interior's rear-compartment surround structure, the padded, leather-covered bar pops up, locking in place in a third of a second if sensors detect an impending rollover. The driver can also raise and lower the bar intentionally by a switch on the console. The shoulder belts are integrated directly into the seats for greater occupant protection, especially in rollovers. The Mercedes SL was the first car with door-mounted side airbags, which were made standard for 1996 models. They're part of the Supplemental Restraint System, which includes dual front airbags and emergency tensioning retractors that tighten the seat belts in a collision. The extraordinary Electronic Stability Program (ESP) can actually help prevent skids and slides. This breakthrough safety system helps drivers maintain directional stability, especially on slippery or gravel-covered roads, by preventing oversteer (rear-end "fishtailing") or understeer (front-end "plowing"). ESP can sense impending loss of control, at the front or rear end, and momentarily apply the brake on one wheel to restore stability, something that even a skilled driver cannot do. Standard ASR straight-line traction control helps ensure stable traction on slippery road surfaces, whether caused by rain, snow or even gravel or sand. This sophisticated system detects if one rear wheel is spinning faster than the other and applies the brake to that wheel to restore traction. Should braking action not be enough, the ASR traction control will reduce engine power by backing off the electronic throttle more quickly than the driver could. All Mercedes-Benz models are equipped with Brake Assist, the first system in the auto industry proven to reduce stopping distances in emergency braking situations. Brake Assist can detect an emergency or "panic" stop by how quickly the brake pedal is applied and then, with lightning speed, apply full braking force faster than a driver could. The BabySmart automatic child seat recognition system, also standard on all Mercedes-Benz passenger vehicles, uses transponders to deactivate the front passenger-side airbag in the presence of a special infant, toddler or child booster seat (available from Mercedes-Benz dealers). The Tele Aid system on both SL models provides both convenience and emergency services at the touch of a button through a special cellular connection. Tele Aid offers three distinct services. For emergency help, there's an "SOS" button above the rear-view mirror. Pushing the SOS button will immediately establish voice contact with ATX - a provider contracted by Mercedes-Benz - which can dispatch local police or other emergency services. This also transmits crucial information including the precise location of the vehicle (through GPS tracking), the model of car, and its color (to help emergency services locate the car quickly). If a collision deploys any airbag, the system automatically establishes contact with ATX, relaying all pertinent information. If voice contact is not established (e.g., the driver is unable to respond), local police, fire or emergency services can also be dispatched. The onboard transmitter is crash-secure and has access to redundant antennae. Tele Aid includes two other features for non-emergency use, both accessed from inside the center console. One button marked with the symbol of a wrench puts the client in contact with Mercedes-Benz Roadside Assistance. Another button marked with the letter "i" connects users with the Mercedes-Benz Client Assistance Center, a facility that can answer product-related questions about the car. For example, the driver can request help with details on the audio system or cellular telephone. A fourth benefit of Tele Aid is vehicle theft tracking, which can actually help authorities locate the car once the owner reports it stolen. Tele Aid eliminates the need to dial a phone number, use a cellular access code, juggle a handset or locate street names during an emergency. Mercedes-Benz is the first manufacturer to make emergency calling like this a standard feature. Moreover, the standard Tele Aid system does not require that the client purchase a cellular phone or service; it operates on its own cellular system. The Mercedes-Benz SL is perhaps the best-equipped two-seater on the market. Touching one button retracts the high-quality canvas soft top completely out of sight into a compartment in front of the trunk. In addition, there's a standard, easy-to-install aluminum hardtop that not only makes the SL a friendly wintertime companion, but also completely changes its look and feel to that of a coupe. A unique option is the Panorama glass hardtop, which replaces the aluminum hardtop when ordered. Made from heat-reflecting tinted glass, the Panorama roof allows the SL driver and passenger to enjoy an open-air view of the sky all year long, regardless of the weather. A standard rear sunshade enhances interior comfort. The extensive list of standard luxury equipment for the SL models includes: automatic climate-control with an electrostatic pollen/dust filter; Bose premium audio system; 10-way power seats; 3-position memory (for seats, tilt-telescopic steering wheel, shoulder-belt height and exterior mirrors); plus a standard rain sensor activates and controls the speed of the windshield wipers. The SL600 adds the adaptive damping system, which automatically adjusts shock absorber firmness to suit driving conditions. Xenon headlamps, heated seats and a six-disc CD changer are standard on the SL600 and are also grouped in an option package for the SL500. The Mercedes-Benz SL celebrates a legacy of driving pleasure, trend-setting style and automobile romance that began in 1954 with the race car-inspired 300SL "Gullwing" coupe. The 300SL roadster followed in 1957, and the SL has evolved through four generations. With each generation, Mercedes has raised the bar on technology, performance and safety, but has always adhered to the timeless appeal of beautiful design. Perhaps that is why, when most people think about Mercedes-Benz, it is the SL they think of first.